There are some special trees in Serpentine Wood. Tucked away among the oak and hazel trees near the District Park are some elm trees, a species that has been devastated in Britain by Dutch elm disease. Once a prominent feature in the British landscape, large elms can be seen in paintings by Constable and Turner. Hazel trees in these woods were once coppiced. 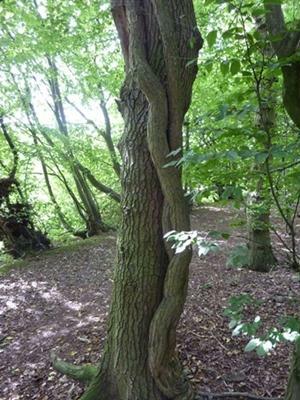 They were cut down to stumps which re-grew to produce many thin stems. The cut wood was used for building, fencing and making charcoal. The southern edge of these woods is marked by an old wood bank, where coppiced trees run in a line on a raised earth bank showing an old boundary. This Woodland Walk leads you around the Great Ashby Estate, taking in five woodlands managed by North Hertfordshire District Council. Four of the woodlands have their own short route for you to explore. Great Ashby is located on the northeastern edge of Stevenage.